Mumma's Corner: GIVEAWAY! 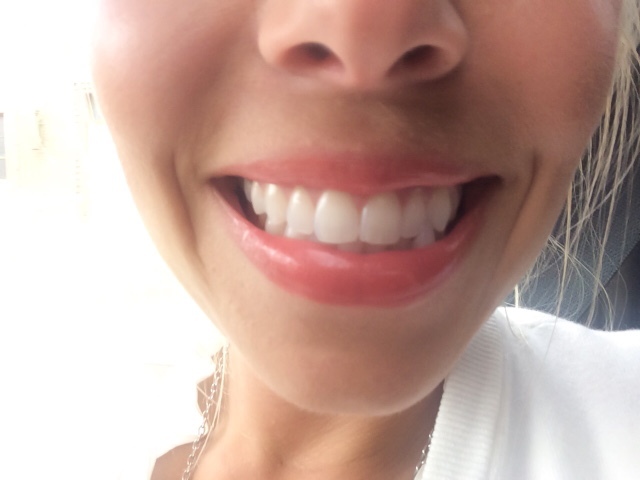 Enter to win your own customized, professional grade teeth whitening kit from Smile Brilliant! GIVEAWAY! Enter to win your own customized, professional grade teeth whitening kit from Smile Brilliant! I am so excited to be hosting this giveaway today for one of your very own customized, professional grade teeth whitening kits you can do from the comfort of your own home! The company is Smile Brilliant and they have been so amazing to work with and truly offer an incredible product that I hope you will look into. If you are one of those people who just don't have much luck with the store bought whitening strips, have painful sensitivity after using store bought whitening strips, or notice store bought strips not to whiten every single one of your teeth in the same way, just keep reading, there is another way! Basically some people just have different genes -- different tooth make-up, and they have naturally darker enamel, which the store bought whitening strips simply do not work for. If you are one of these people, maybe you notice they work, but you have to buy the most expensive one, and you have to wear them for 3 hours or so, and you have to buy these and re-do these treatments frequently. But what you actually need is the professional whitening treatment, because the store bought strips simply do not work for everyone. Until Smile Brilliant, you had to get these at your dentist office, and come back for multiple trips to create the mold and do the treatments, and which also would cost you a pretty penny - $500 plus. Smile Brilliant offers the same quality professional dental whitening treatments, but that you can do from your own home. It is all very simple and they give you easy to follow, detailed instructions on how to take your impressions and use the trays (Watch the short video above! ), and they also give you de-sensitizing gel to use afterwards which restores your enamel to not feel any sensitivity after using. My husband is definitely one of those people who has naturally darker teeth, and who had to constantly re-buy the most expensive store bought strips, and these worked the best ever on him. Another little added plus with these was that he was still able to talk and conduct business as usual with these trays in (they are just like wearing a retainer) - so it did not interrupt any of his business as usual. The added plus for me was having the custom mold to my own teeth. The store bought strips do not work well on my bottom teeth because my bottom teeth are kind of crooked, and there is one tooth kind of set back that the strips simply can't get to because it's set farther back, but since these trays are custom, every single tooth got just as white. What I also love is that they offer a desensitizing gel to apply after whitening, which helps emmensly with the painful sensitivity I always get from whitening. You can read additional reviews on Smile Brilliant here. Giveaway will run for 1 month from today and officially close at 12:00 pm on August 9, 2015. Winner will be notified via the email they provided by a Smile Brilliant representative. In addition, you can use referral code "mummascorner" to receive 5% off the entire product list at Smile Brilliant. That de-sensitizing gel sounds good because I'm always afraid getting my teeth whitened will hurt after because they're so sensitive. I like the way the strips work but it's only temporary I feel and isn't whitened enough to be work $50!